The coho salmon of Mill Creek have had an especially rough go of it in 2014. During last fall’s spawning season, they swam up the main stem of the Russian River only to find the corridor back to their spawning grounds cut off before they could reach their destination. There had been too little rain to reconnect Mill Creek to the main stem of the river, and the coho spent the better part of two months treading water and waiting, and waiting … and waiting for the rains to come. In February, the season’s first major rainstorm finally arrived, but Obedzinski thinks few of the exhausted fish made it up the high gradients to prime spawning habitat in the upper reaches of Mill Creek. When the rains faltered again later in the spring, the mouth of Mill Creek dried up yet again. Many of the juveniles from the previous year’s spawn, who had started their migration downstream for the ocean, were observed trapped in small pools, only to disappear a few days later. The only clue to their fate was the heron tracks around the pools. For a species so sensitive to rainfall patterns, the ongoing drought hits hard. It may be that in the past coho were able to survive periodic droughts by sheer force of numbers, but given that other stressors have whittled Northern California coho down to a beleaguered few, a severe drought such as this year’s has the potential to push the population over the edge. The last three years have seen the least precipitation in a three-year stretch in recorded California history, and the coho are not alone in their suffering. California has always had unpredictable rainfall, and the salmon, like the other plants, animals and people who make their homes here, have a history of making it through to the other side. But in this era of climate change, any severe or unusual climate pattern becomes not just a survival challenge but a source of anxiety: What if the drought is not an aberration but the “new normal”? How much of what’s happening in the skies can scientists ascribe to climate change come home? According to the Palmer Drought Severity Index, a national measurement of drought conditions, California is now in its most severe drought since records began in 1895. To make matters worse, the deepening drought was coupled with the warmest winter and spring on record, creating a “perfect storm” for the region’s ecosystems— unfortunately, only in the metaphorical sense. Superlatives are becoming commonplace among climate scientists. Droughts are, of course, nothing new to California. 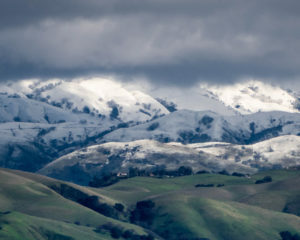 Precipitation in California has the highest year-to-year variability of all the Western states. Because rainfall is determined by the limited number of storms — on average around five or six — that blow in from the Pacific between late fall and early spring, a shortfall of just a couple of those winter storms can set the stage for drought. Conversely, an additional storm or two can produce severe flooding. California’s flora and fauna have evolved to deal with long periods of dry weather — the coho, for example, can survive in even half a cubic foot per second (CFS) of streamwater if its spring fed, Obedzinski says — but there’s dry and then there’s dry. University of California, Berkeley biologist Todd Dawson, who along with Ackerly has measured the effects of the drought on various native plant species, says that at one of their research sites near San Luis Obispo on the central coast, blue oaks, one of the state’s most widely distributed oak species, are in the worst shape anyone has ever seen them. “They’ve got these dinky little leaves, not even the size of your pinky fingernail, ” Dawson says. By early June, the leaves were already falling off because of water stress, sending the trees into dormancy during the height of their normal growing season. The trees were trying to hang on in soil with a measured moisture content of between 2 to 5 percent (normally it would be between 12 to 18 percent). This year’s extreme drought has set off a flurry of research as scientists seize the opportunity to better understand what it says about the changing climate and how the state’s ecosystems will fare in a climate-changed future. While scientists are notoriously reluctant to tie any single year’s weather to climate change, many are willing to say that the degree of warming associated with this drought — which exacerbates the impacts of the lack of rainfall — bears all the hallmarks of climate change. What water has fallen has evaporated quickly, instead of staying in the soil and vegetation; what was supposed to fall as snow fell as rain, and what snow did drop melted quickly, leaving waterways that depend on the Sierra snowmelt parched. At the end of June the National Weather Service reported that it was the warmest first six months to a year ever recorded in California. It’s one thing to say that climate change is making the drought worse because of higher temperatures, but something else entirely to say that climate change itself is a cause of reduced precipitation. Because if that’s true, then human activity is not just exacerbating an existing pattern, but influencing the pattern itself — and what we’re seeing this year could be an unpleasant dress rehearsal for what’s to come. Swain is an earth scientist who studies extreme weather events in the context of climate change, and he’s made a name for himself by publicizing the peculiarities around the failure of the past year’s rains. Meteorologists attributed it to a high-pressure atmospheric system anchored over the Gulf of Alaska that deflected storm after storm to the north (and eventually directed them to the Midwest and East Coast, which got slammed with cold, snowy weather by the so-called Polar Vortex). The ridge first appeared in the 2012-2013 winter season, so it’s been around for two winters now. Swain says such a two-year pattern has never appeared in the meteorological record before and has led scientists, including himself, to look for a climate change connection. “What are the physical causes in the ocean or atmosphere that allowed this to happen in the first place?” he asks. Simon Wang, a climatologist at Utah State University, identified a potential answer in a paper published earlier this year in the journal Geophysical Research Letters. Atmospheric ridges over the eastern Pacific and accompanying low-pressure zones in the East, a condition the paper labels a “dipole,” often form over the West Coast one year before an El Niño event because of a particular pattern of wind and sea surface temperatures in the western north Pacific. But Wang and his colleagues found that since the 1970s this El Niño “precursor” has gotten stronger and more persistent, and tracks the rise in greenhouse gas emissions. Wang’s paper suggests that the endpoint for even the most severe ridges will be an El Niño, and he says that more frequent El Niños could themselves be a sign of climate change. An El Niño is indeed expected for the coming winter (2014–15) — although the latest forecasts predict it will be a weak-to-moderate one, with an uncertain effect on precipitation in northern California. Wang says his paper suggests a future that oscillates between climate extremes: a stretch of dry years, a burst of rainfall if the El Niño is strong, then back to dry. While that might sound like it builds the solution to drought into the problem, it doesn’t, at least for plants and animals that depend on reliable water: rain that falls following prolonged drought races off the parched ground, causing flash flooding and leaving vegetation little time to soak up the slow-and-steady water diet it needs. Vegetation that does grow back becomes fuel for massive wildfires in drought years. Les Rowntree, an environmental geographer and retired professor of environmental studies and geography at San Jose State University, says that water managers tend to look at the drought from a natural resource perspective —how many inches fell in a year. Rowntree and his colleagues worry about ecological drought, in which the rains come but not at the time that the flora and fauna need it. “Drought has many different flavors and many different faces to it and many different effects,” Rowntree says. Even if it’s hard to say how the wet years and the dry years will balance out, scientists are pretty sure that even wet years are going to feel a whole lot drier because of the effects of warming. “Warmer and more extreme” happens to also be one of the stories of California’s past climate, so while the warming then wasn’t human-caused, some scientists have looked back in time to try to gain a glimpse of tomorrow. One drought from that past worth examining is the “Great Medieval Drought,” which lasted more than a thousand years and was punctuated by a period of extreme flooding in the West. Somewhere around the year AD 900, the West turned dry as temperatures rose, and the drought brought about some significant changes to ecosystems, Ingram writes in her book. Sediment cores from marshes in the San Francisco Bay indicate a 40 percent increase in salinity above today’s levels, presumably because of diminished freshwater input. Elsewhere in the state, submerged tree stumps found in Mono Lake depict a shoreline that had receded several tens of feet lower than the present. Tree ring samples from giant sequoias in Yosemite National Park and Sequoia National Park showed repeated fire scars, indicating frequent fires, while archeological evidence of Native Americans in California show food shortages and an abandonment of settlements along rivers. Then, around AD 1100, the rains came as deluges for about a hundred years before drought conditions returned. Could our future under climate change look even remotely like this? Ingram said that persistent severe droughts interspersed with floods — in sum, a tendency towards the extremes, however frequent the cycle — could be a feature of the past that holds true for the future. “That is how we respond in California, if we use the past as a guide to what might happen,” Ingram says. Droughts and floods, though devastating in many ways for humans with fixed infrastructure, are not always or altogether a bad thing for natural habitats. Wildfires, the inevitable result of droughts, can open up new habitat for species and cycle nutrients into the soil if they’re not too hot; floodwaters spread nutrients and other organic material around as well. Warmer weather may exacerbate the drought for many species, but some natives have actually fared better in a milder winter. For instance, the resident population of wrentits at Point Reyes National Seashore has exploded this year according to biologist Geoff Geupel, director of emerging programs at Point Blue Conservation Science. Wrentits are small greyish-brown songbirds that thrive in Pacific Coast chaparral and coastal scrub. Geupel says on one study plot, 95 percent of the adults surveyed survived as did a similar percentage of the previous year’s hatchlings. That’s resulted in the highest density of wrentits ever observed in the 35-year-long research program, a surprising discovery since wrentits, like most songbirds, are territorial sorts. The milder winter, in turns out, has been advantageous to this species, which can apparently still forage enough food. However, Geupel says it’s unclear what the bird’s fate would be under longer-term drought. Fire would nip away at encroaching Douglas fir, which threatens to turn the wrentit’s scrub land into forest at Point Reyes, but too much fire could leave only grasslands. Todd Dawson wonders if Northern California could end up losing much of its forests and begin to look a lot more like a Southern California landscape with chaparral and grasslands predominating. “Is that the future? That is a question we don’t have an answer for yet, but these kinds of years might give us an insight into where the vegetation is going,” Dawson says. Meanwhile, meteorologists, water supply managers, fishery biologists, firefighters, and just about everyone else in the state maintain an anxious watch over the host of mixed signals from the ocean and the jet stream, hoping to finally see a steady parade of moisture laden storms blow in from the Pacific.